A source from the state government told CNN-News18 that the main reason for the holdup in giving permission for the Jallikattu event is that it is surprised that the event is in a league format. Chennai: A ‘Jallikattu league’ in Tamil Nadu was all set to kick off here on January 7 but the event has hit a hurdle with the state government still not granting approval for the event. A source from the state government told CNN-News18 that the main reason for the holdup is that it is surprised that the event is in a league format. The government doesn’t want a traditional sport to be played in an IPL-like-format. Nor does it want to encourage the ranking of the bulls and players, the source added. The source further said that the initial venue the organisers chose was not in compliance with the Supreme Court guidelines. An organiser of the event, on condition of anonymity, said they are confident that an approval from the state government for the event will come in a day or two. “We never called it a league. The media made the Jallikattu event a league-like format. The state government was also worried about corporates sponsoring the event. We had no intentions to commercialise the event. We wanted to clear the doubts of people who said the bull-taming sport is a form of animal cruelty,” he said. The organisers have chosen another location at MARG Swarnaboomi on the East Coast Road. The location for the event initially was a place opposite the Madras Crocodile bank on the ECR. From questions over adherence to a Supreme Court ruling over conduct of the game to stiff opposition to corporatisation of the traditional sport, the organisers are waging a multi-fronted battle to get the event going. They may now have to shift the venue to a far-flung location. The initial idea was to have teams from Chennai, Coimbatore and Madurai participate in the event. 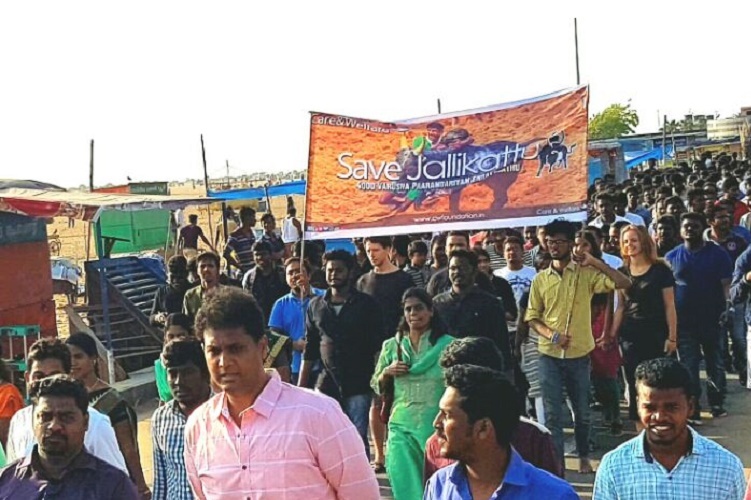 In January 2018, massive protests broke out at Marina Beach where protesters urged both the state government and the Centre to repeal the ban on Jallikattu. Following unrelenting protest, the then chief minister O Panneerselvam issued an ordinance that amended the Prevention of cruelty to animals act. This was later introduced as a bill in the State Assembly and was unanimously passed. However, the case is still pending in the Supreme Court. 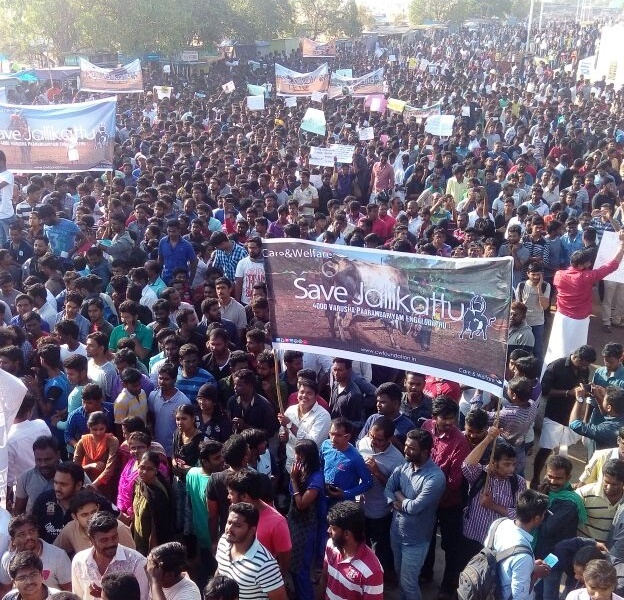 Social media appeared to have played a key role in bringing together thousands of pro-Jallikattu protesters to the sprawling Marina Beach here and other parts of Tamil Nadu, with updates on the ongoing students’ spontaneous stir and messages flooding the platform. Sites including Facebook were awash with “Let us be united”, “We want Jallikattu,” and “I support Jallikattu” pages, which together account for lakhs of followers, who kept commenting on the evolving situation and pressing their cause. Facebook pages like “Jallikattu veeravilayattu,” specially designed to spread messages on the bull-taming sport and protest across the state were active with live updates. Special folk songs were uploaded and real time pictures, videos of protests were posted regularly which helped the information reach more and more people, prompting several of them to join hands. For instance, a social media user Manikandan uploaded pictures of protest between Madurai and Theni in ‘Jallikattu veeravilayattu’ Facebook page. A college student here, R Sukumar, said he joined the protests on the Marina Beach responding to a campaign in Facebook by several other students. Also, posts like “No Jallikattu, no vote” and “save native cattle” dominated social media sites. Each Jallikattu protest and information related to it got thousands of “likes” on Facebook. In Twitter, hashtags like “justice for jallikattu,” “save our culture jallikattu” continued to trend through the day with countless messages. Also, messages like “I can arrange dinner, lunch for protestors,” “I can provide drinking water please contact…” were also abound, indicating how the students were organising and managing the protests. With Pongal, the biggest agriculture-related festival of Tamil Nadu being round the corner, the controversy on Jallikattu, a bull-taming sport celebrated in Pongal, has once again come to the fore. What has been a tug of war between the traditional Tamil culture and a group of animal lovers, has also been intertwined with court cases and political discussions in the state and the centre. The 2000-year-old traditional practice of taming a bull, which is linked with the cultural tradition of Tamil Nadu as a popular sport among warriors since the “Sangam era” finds a mention in the ancient Tamil text “Silapathigaram”. The specially trained bulls are lead through a small gate to a restricted path, where the local lads try to conquer it by jumping and holding onto the hump of the bulls. Accidents, both minor and major, often occur as the panicked bull throngs its way through the gate into the crowd. The State Chief Minister O Panneerselvam, in a letter to Prime Minister Narendra Modi on Monday, describes the game as: “It is inextricably linked to rural, agrarian customs and has religious significance, with families donating bulls to temples in fulfilment of vows. Jallikattu also addresses the cause of conservation of native germplasm since bulls with excellent physical attributes are reared. Further, bulls are not harmed or physically tortured during Jallikattu”. The Tamil Nadu government has now sought the central government to consider issuing an ordinance to enable people in the state to conduct Jallikattu. This is at a time when animal lovers link the game with the bull fight in Spain, where the bull is brutally killed for the pleasure of the viewers. In a judgement on May 7, 2014, the Supreme Court of India, banned the conduct of Jallikattu in the State of Tamil Nadu and also held that bulls cannot be used as performing animals either for Jallikattu events or for bullock cart races in the states of Tamil Nadu, Maharashtra or elsewhere in the country. “The ban on Jallikattu has caused widespread resentment and general disappointment among the people of Tamil Nadu, particularly in rural areas, since Jallikattu is intertwined with religious and social cultural ethos of Tamil society,” says Panneerselvam. The centre is against Jallikattu since allowing the game could be a political gain for the ruling party in the centre. In January 2015, the government of Tamil Nadu had requested Modi’s personal intervention to enable the conduct of Jallikattu events in Tamil Nadu by denotifying bulls from the list of performing animals in a notification dated July 11, 2011, issued by the Ministry of Environment and Forests, Government of India. The centre has also issued a notification on January 7, 2016, which was expected to enable the groups to conduct Jallikattu during Pongal, which falls in the middle of January. However, it was stayed by the Supreme Court and the game was not conducted legally during these years, though in some places, people tried to conduct it without the approval of the administration. A review petition was filed by the government of Tamil Nadu on May 19, 2015, and the Supreme Court refused to review its earlier judgement, dismissed the review petition on December 16, 2016. The state government has now demanded that the Union Ministry of Environment and Forests, should clearly denotify bulls “as performing animals” from the notification issued on July 11, 2011, and suitably amend Section 11(3) of the Prevention of Cruelty to Animals Act, 1960 by introducing a new clause in sub-section (3) of Section 11 specifically exempting Jallikattu in addition to other exemptions already provided in the Act. The traditional game of Jallikattu has its own business nurtured over a period of time, Organisers and locals say the ban will have a direct impact on thousands of farmers and his family, who depend on this breed cattle for livelihood. According to organisers, a bull can fetch as high as Rs 2 lakh to a farmer and it would cost about Rs 20 lakh in one major village. Jallikattu had been organised in 24 places between January 14 and January 17 in Tamil Nadu. An event can raise upto Rs 15 lakh in a village apart from the prizes, said Balakumar Somu, one of the ardent follower of Jallikattu earlier. Somu, an IT professional quit a job in Singapore, relocated to Coimbatore and started a website supporting this sport. According to him, a farmer invests around Rs 5,000 to Rs 10,000 to buy a calf and the entire family spends money and energy for 1.5 years to grow the calf into a healthy bull. They use Jallikattu as a platform to find a buyer and the bulls which wins can stretch around Rs 1.5-2 lakh to the owners. The buyers, who are mainly rich people buy these bulls as a matter of pride, employee around 5-6 people to maintain it. The people who are employed, mostly women, get about Rs 800-900 per week as salary. Thousands of artisans also get affected as in many villages, a major source of income has been creating decorative items, including specialised ropes for the bulls and for the race. Jallikattu may be a three-day sports festival, but it has been the source of income for farmers throughout the year, said Somu. The organisers spend anywhere between Rs 50,000 and Rs 20 lakh to organise Jallikattu it depends on the village. The money will be spent on preparing the ground for Jallikattu, deposit money, gifts including, motorcycles, gold coins, bicycles, steels almirahs and sheep and goats. The money is mobilised through sponsors and advertisers, most of them being local brands. These take space in t-shirts, which players wear on the ground and also merchandise including, coffee mugs, posters, coasters, pens, bedsheets. This will also affect the special breeds used in Jallikattu, including the Kangeyam breed of bulls. Already, the number of Kangeyam bulls has come down from lakhs to tens of thousands. “The banning of Jallikattu and the demand for banning of other rural sports like rekhla race will ultimately result in the vanishing of native species and ultimately result in the country turning into import dependent on bovine animals,” says Karthikeya Sivasenapathy, managing trustee, Senaapathy Kangayam Cattle Research Foundation (SKCRF). The foundation breeds Kangayam bulls and cows and also works on the preservation of native breeds. According to him while the Kangayam cow costs around Rs 25,000-35,000 the bull is available for Rs 10,000 only. Sivasenapathy said the population of Kangayam variety has come down to one lakh animals from 11 lakh in 1990. People with total disconnect with livestock, rural life or villages are ones who claim that farmers do not love animals, whereas, farm animals are part of the rural household. He said cattle farming in India is part of the household activity and not a corporate activity. On Thursday, the Supreme Court rejected a plea, seeking a judgment on the bull-taming/embracing (depending on which side of the debate one belongs to) sport of Jallikattu before Saturday. In other words, the practice will continue to be banned this Pongal if the Centre does not intervene and pass an ordinance. Jallikatu is a traditional rural event organised as part of the five-day Pongal celebrations, which begins on January 14 this year. Unlike in the bull-fighting event in Spain, the bull is not killed, and the object is to pluck bundles of money or gold tied to the animal’s sharpened horns. In 2014, the sport was banned by the Supreme Court following objections from animal rights activists, citing animal cruelty and a threat to public safety. Ever since the judgment, the court has been hearing petitions supporting this traditional event. Last July, the court had said Jallikattu might be 5,000 years old, but it was for the judiciary to decide whether the practice could continue. “We have to show compassion to the animals. It is our constitutional obligation,” it said. Reports indicate that the court’s position has angered many in the state of Tamil Nadu, who believe that a ban on tramples on not only their traditions but also effectively destroys entire native livestock breeds that depend on the event. On Wednesday, Tamil Nadu Chief Minister O Panneerselvam urged Prime Minister Narendra Modi to pass an ordinance to allow Jallikattu during the Pongal festival. Animal welfare activists have long demanded a ban on the event/sport for the significant levels of cruelty and torture, the bull undergoes. In a column, Poorva Joshipura, the CEO of People for the Ethical Treatment of Animals (PETA) India, wrote: “During Jallikattu, bulls are deliberately terrified and forced into menacing crowds through various cruel means. They are purposefully disoriented through substances like alcohol; have their tails twisted and bitten; are stabbed and jabbed by sickles, spears, knives or sticks; have their nose ropes painfully yanked; are punched, jumped on and dragged to the ground.” In Jallikatu-like events across India, many humans also suffer severe injuries or even die from participating or watching the sport. In this decade, until the ban came into force, there were reportedly more than 1100 injuries and approximately 17 deaths, including that of a child. The apex court’s position on the subject is if culture or tradition is ‘not in sync with the law’, then the latter takes precedence. Unlike the apex court, the Centre has taken a favourable position, arguing that Jallikattu is a centuries-old traditional practise. The Centre respects these practices, although it has asked organisers to ensure that there is no cruelty. Animal welfare activists have mocked this position, but local activists against the ban have argued that the event is not about taming bulls, as much as embracing them. In a recent post on social media, Balakumar Somu, an animal’s rights activist from Coimbatore, who has started a website to fight the ban, wrote on the subject. 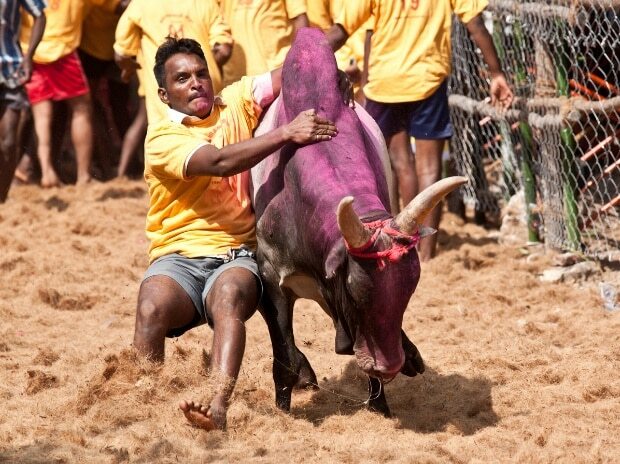 “To honour those who bring up the stud bulls and to demonstrate the strength of the bulls annual sports of sorts are organised: one of these sports is Jallikattu. This is not taming the bull as is often misunderstood. It is actually embracing the bulls. The men should embrace the speeding bull and hold on to it as long as he can. In Spanish bullfights, the participating bulls are killed. But here in India, the bulls become much-celebrated beings of the village and the families,” he writes. Arguments citing animal cruelty are either over exaggerated or wholly fabricated, say supporters of the event. Himakiran Anugula, an organic farmer and entrepreneur, based in Chennai, presents ecological and economic reasons against the ban. In a recent post on a news website, he writes: “If Jallikattu is prohibited, livestock keepers will be forced to abandon the raising of native livestock, which already stands threatened due to the extensive use of motor pumps, tractors and mechanised agriculture. If the sport is banned, it would be the death knell of native cattle species in Tamil Nadu. We will lose not only our breeds but also our self-sufficiency in milk production as well as the promotion of organic farming. If we lose our breeds and import foreign breeds, multinational commercial companies will dominate the dairy industry in India. The livelihood of millions in rural India is at stake here. People who want a ban on Jallikattu are far removed from village life and do not know how this chain works.” Going by the arguments presented above, it would seem as if a complete ban on Jallikattu seems a tad unreasonable. If there are instances of animal cruelty, tighter regulations should be introduced and enforced to ensure their safety, as well for those people attending these events. Any attempt to ban such traditional practices often suffers from plenty of pushback from those directly affected. How does one enforce a ban, when the people and the entire state machinery stand opposed to the court’s diktat? Moreover, if animal cruelty is going to be cited to prohibit certain events or products, then our courts will have to go way beyond Jallikattu, starting with leather goods and fast food franchises. Will the court ban leather goods or McDonald burgers, as well? The rally was organized by students and software professionals through campaigns on WhatsApp and Facebook. The Marina beach in Chennai was witness to a huge, and according to participants, a ‘spontaneous’ rally on Sunday morning as nearly 10,000 people gathered to ‘Save Jallikattu’, asking the Central and State government to do whatever in their means to allow the cultural tradition to continue this Pongal. The rally was organized by a group of non-political and youth organizations. “There were thousands of students from colleges and IT professionals who had gathered. It was a spontaneous movement. No political party or big group organized this, it was a joint effort by people in the city, to call for help for farmers and bull-owners,” said Balakumar Somu of the Biodiversity Conservation Council of India, which was a participant in the rally and has been lobbying for pro-Jallikattu legislation in the past few years. Other pro-Jallikattu organizations and groups also participated in the event, which gathered momentum predominantly through social media platforms like WhatsApp and Facebook. Crowds stretched upto a kilometer long on the beach road in Marina and the event dominated Tamil news channels all morning, with channels beaming live and continuing the programming through the day. As the festival of Pongal approaches, calls for Jallikattu to be allowed to happen are getting louder in the state. It is during the festival of Pongal that Jallikattu is usually held in several parts of Tamil Nadu. “Bull Taming” is not just a sport, it is a part of the Indian identity which has been slowly weaned away from us, and today corporates and so-called animal lovers are teaming to put an end to this age-old tradition which has ensured that the best Indian breeds are carried forward and protected for future generations,” says TRB Rajaa, the MLA of Mannargudi, who participated in the rally in an independent capacity. The Supreme Court of India banned the organizing of Jallikattu under the Prevention of Cruelty to Animals act in 2014. Following this, ahead of the 2015 Pongal, the central government issued a notification creating an exception for religious sports like Jallikattu, thereby allowing them to happen. However, organizations like Animal Welfare Board of India and PETA got a stay order on the notification, in effect banning Jallikattu again. This case is now pending at the apex court. Participants feel that the state government could also pass an ordinance and get it signed by the Governor and the President of India. “But it is the Centre which is in the best position to make this happen,” Somu says. Farmers associations across Tamil Nadu have expressed happiness with the rally. “We thank the youngsters in the city for organizing the event. Usually it is believed that people in the city don’t care about rural issues. They have showed that’s not the case. At least now the government should do something to allow Jallikattu to happen,” Balakrishna of Tamil Nadu Farmers’ Sangam told Sun News. Even though on duty, many policemen have shown their solidarity with the protests in different ways. The unprecedented protests in favour of jallikattu in Tamil Nadu have seen people from across social classes participating in the movement. There have also been instances of members from the police force taking part in the protests even as they’d been stationed at the site on duty. Images of policemen distributing food and water to the protesters have also been doing the rounds on social media. 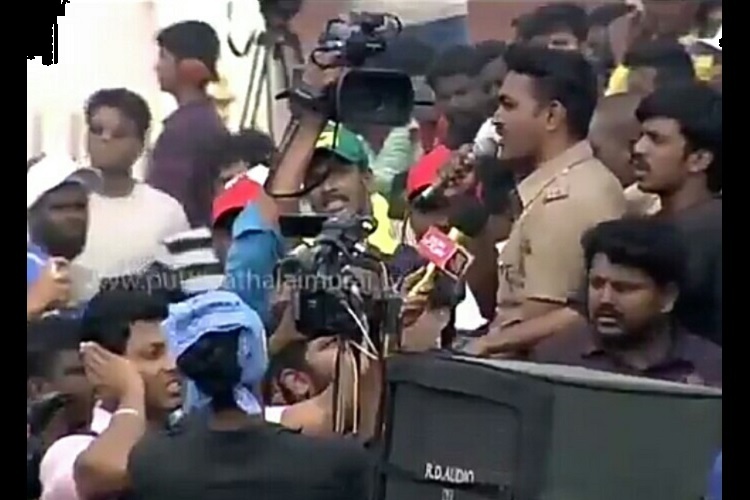 An electrifying speech given by a policeman during the protests at Marina beach in Chennai shows how deeply emotional the issue is to the people of Tamil Nadu. If we let the bull that has been with us for thousands of years to die, how can we say we’re Tamilians? There are babies in this world who have not had mother’s milk, but are there any babies in this world who have not had cow’s milk? They keep saying farmer-farmer…this is an issue that’s important to the farmers. Is a government who doesn’t understand, is this a government at all? What is natural farming? The farmer puts water, cowdung and prepares the land. But now how do they do farming? The soil has been killed by using artificial chemicals. Next, they’re going to kill the cows by stopping jallikattu. The Times of India reports that Mathiazhagan is from Ramanathapuram and that when senior police officials heard about his speech, they rushed towards him and asked him to get back to duty. They have, however, assured the protesters that no action will be taken against him. “There is nobody instigating me to be part of this protest. It is my Tamil identity. It is the Tamil I studied which brought me here. It is the Tamil in my blood. The people fighting here, not caring about hunger, are fighting for their rights. I’m also a Tamilian. Why should I stay away? When my people are going hungry, why should I stay away? I should also participate. The police has been appreciative of the crowd’s peaceful and cooperative behaviour. RJ Balaji’s speech at the Marina, crediting the protesters for getting the government to pass the emergency ordinance was greeted with wild cheers. “It’s not the 39 MPs we elected who have done this, it is you!” he said. He also said that revolution had happened in Egypt but that this was the first time such a thing was happening in India after the Independence movement. Get the latest information about Jallikattu Events, Photos & News ! Download a copy of the Judgement Order Copy of the Supreme Court of india banning Jallikattu. thanks for your support …keep supporting us….